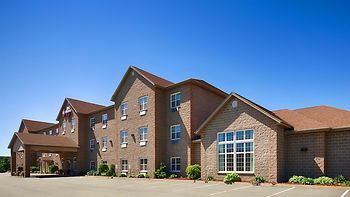 Best Western Plus Liverpool Hotel & Conference Centre, Liverpool, Canada - Lowest Rate Guaranteed! Located in Liverpool, Best Western Plus Liverpool Hotel & Conference Centre is in the business district, a 5-minute walk from Hank Snow Home Town Museum and 15 minutes by foot from Pine Grove Park. This 4-star hotel is 0.9 mi (1.4 km) from Astor Theatre and 1.1 mi (1.8 km) from Queens County Museum. The hotel was clean, staff friendly, and having a pool was a bonus (for my child). Perhaps a larger space for the breakfast area. It seemed very crowded in the morning. Awesome staff!!! Super clean hotel had an awesome stay! Staff was great; easy check-in/out. Breakfast room was very helpful. I do find the in-room heating/cooling controls challenging to keep the room balanced between hot and cold. Perfect room for pet. Great breakfast. Loved pool and hot tub. Walking distance to casino.